This project has generated a new geological map for the Greenwood (NTS Sheet 082E/02) area and a compilation map for the eastern half of the Penticton map sheet (NTS Sheet 082E). These maps, part of a larger mapping project initiated in 2005, provide an updated geological framework for potential mineral targets in southeastern British Columbia's Kootenay-Boundary district. Focusing more closely on geological units and structure of the Paleogene period of geological time, the study provides new exploration insight into Boundary District mineralization, and allows comparisons with the Republic District in northern Washington immediately to the south. The Boundary District has an extensive history of exploration and mine production that dates back to the late 1800s. New mapping and compilation of geological, geophysical and geochemical data provides a framework for evaluating potential mineral targets in the district and to guide responsible development in an area that has seen renewed exploration interest in recent years. compiling an updated geological map for the east half of the Penticton map sheet (082E). 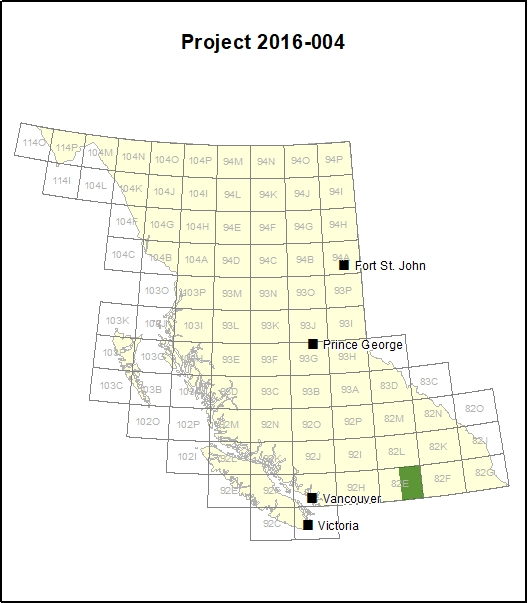 The Boundary District project will help to identify new natural resource opportunities in the Kootenay-Boundary regional district and inform resource development decisions. This project combines new and existing data to provide a base map to evaluate tenures and to explore for new deposits. Exploration spending and the potential development of new mines would bring investment and employment opportunities to the area. The Boundary District has had an extensive history of exploration and gold production that dates back to the late 1800s when several towns such as Beaverdell, Rock Creek, Greenwood, Carmi, Boundary, Midway and Grand Forks were founded. Several gold and silver (plus copper, lead and zinc) deposits have been mined in the Greenwood area since the first discovery in 1884. More than 25 past producers are recorded in the Greenwood mining camp. This includes the Phoenix mine, a world-class open pit copper-gold skarn deposit, several smaller mines, and over 100 recorded mineral occurrences. The project updates mapping in the Greenwood mining camp and surrounds, south and west of Almond Mountain and Grand Forks, and compiles recent mapping in the area. Data was collected during approximately 30 days of field mapping in 2017 using a 4×4 truck and a two-person crew. Maps were compiled on 1:20,000 trim sheets, then digitized and presented in GIS and hard-copy format. A new 1:50 000 scale geological map of the Greenwood map area was produced. Further work is required to better understand key geological subdivisions and mineral potential in the Marron Formation.